The Customs is sometimes called the "Police of goods", as it ensures the security of international supply chain while eliminating dangerous goods and materials from the market and fighting illegal activities such as money laundering, smuggling of goods or counterfeiting which represent a serious threat to society. Apart from its fiscal role, the Czech Customs Administration carries out important tasks in the area of security such as fight against terrorism and extremism and together with the police and fire rescue authorities participates in other actions ensuring the security in the Czech Republic. Considering the latest development in Europe, the Czech Customs Administration has been recently involved also in the area of migration. With respect to the security issues, the activity of the World Customs Organization should be mentioned. In June 2005, the World Customs Organization´s Council adopted the SAFE Framework of Standards to Secure and Facilitate Global Trade (SAFE Framework) that would act as a deterrent to international terrorism, secure revenue collections and promote trade facilitation worldwide. The Czech Customs Administration is actively involved and complies with all the requirements stipulated by this programme. To ensure efficient performance of the above mentioned tasks, the Czech Customs Administration has been empowered with surveillance and investigation competencies. It has technical means such as customs mobile labs at its disposal. This technical mobile unit is unique in Europe and it ensures operational detection of transported goods especially mineral oils, alcohol, narcotic and psychotropic substances. It is capable to obtain and analyse samples of the transported fuels directly on the spot from the cistern vehicles. These activities are important from the perspective of health and security of our citizens. Another example of the latest technology is a new large capacity mobile scanner – a new technology capable to identify both organic and inorganic substances. It is the only high-tech equipment available in the Czech Republic capable to scan all means of transport on the roads and elsewhere. In this way, it can be used to identify all kinds of illegal transport of ammunition, weapons, military materials and dual use goods and other materials dangerous for health and security of Czech citizens. The above mentioned equipment as well as the work of the worldwide respected Czech Customs Administration´s canine service will be presented at the Future Forces Exhibition. The Czech Customs Administration is a part of Integrated Rescue System and upon request, it cooperates with other enforcement authorities during emergency and crisis situations. The active involvement of the customs officers and technical equipment of the Czech Customs Administration in rescue operations during the major flooding in the Czech Republic is a practical example. 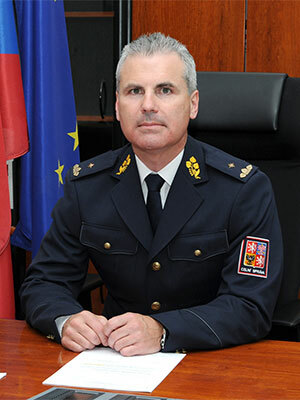 I am very pleased that the Czech Customs Administration has the privilege to become, for the first time, part of the Future Forces Forum and will actively participate in the exhibition. My expectations from our participation would be to exchange the experience in the area of security technology, and at the same time, to acquire insight into the latest high-tech development in this field.